Beyond the din and dancing lights of the Las Vegas strip, a young woman has mysteriously gone missing. All the facts point to something sinister — even paranormal. Quentin Draith, supernatural crime investigator, is hired to assist. However, the deeper Draith digs, the more otherworldly his assignment gets. Assassins, human and otherwise, put a target on Draith’s head and a ravenous alien beast starts rampaging through the city. The clues point Draith to Sin City’s infamous “Bone Triangle,” a neighborhood marked for its dark happenings and disappearances. And when Draith finds that the woman’s disappearance may be linked to an alien plot against the city, he goes all in to make a final high-stakes play to save the city he loves. 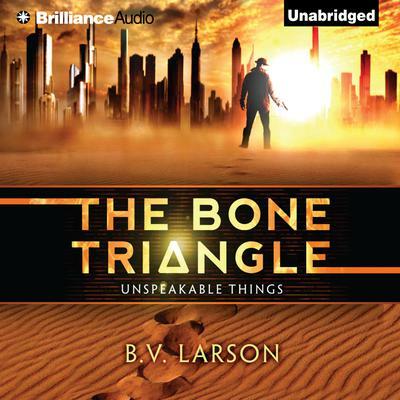 Intriguing, unexpected, and mesmerizing, The Bone Triangle is the second in bestselling author B. V. Larson’s Unspeakable Things series.